When we’re children, the world is a magical, fantastical place. Every new experience is something amazing. The simplest thing can change who we are for the rest of our lives. For me, that first visit to the ocean made me who I am today. Hammonasset Beach State Park in Madison, CT was the first place I ever remember seeing the ocean. We’d have family trips in the summer and the end of the year party for my elementary and middle school class was at a friend’s house on the beach. I loved the ocean: playing on the rocks, crabbing, running from jellyfish, and swimming in the water. I’d always loved being in the water and had been brought up floating in the neighbors pool. But the ocean was so different. Being cold, New England water, it wasn’t very clear and I was scared to go in past where I could see my toes. I would, however, bite my lip and swim out to my Dad, even if I couldn’t see below me. One day, we got to go to Misquamicut State Beach in Westerly, RI. It was our reward for visiting relatives, which is never fun when you’re young. And what did I see when we got there? WAVES! Real big ocean waves! The south Connecticut shoreline, mind you, is on Long Island Sound and has 3-6″ waves at most. This was water worth playing in, no matter what was below. Grabbing our boogie boards, my Dad, sister and I surfed the waves all day long, until out fingers were wrinkled and blue. The lowly, little waves at Hammonasset just weren’t gonna cut it anymore. At least my parents had a bargaining chip for more visits with the relatives. From that point on, I had to know more. What was out there that I couldn’t see? Maybe it wouldn’t be so scary if I knew what my toes would be in for. Luckily for me, Mystic Aquarium in Mystic, CT was not that far away. Trips to the aquarium turned into a special occasion and birthday presents. I loved watching the fish swim though their coral homes, play the interactive games, drive the submarine and clap as dolphins sailed through the air. I never would have guessed I would be back years later and see even more. Tiggy on left, Frisco on right. Courtesy of Dr. Jessie Sanders. Tigger were the best cats any little girl could ask for. Frisco was technically mine, and Tigger my sister’s, but I loved them both. I read more books about how to take care of them, made them toys and read Garfield to Frisco. Frisco sat next to me at dinner, slept next to me in bed and made an awkward, lonely, little girl very happy. 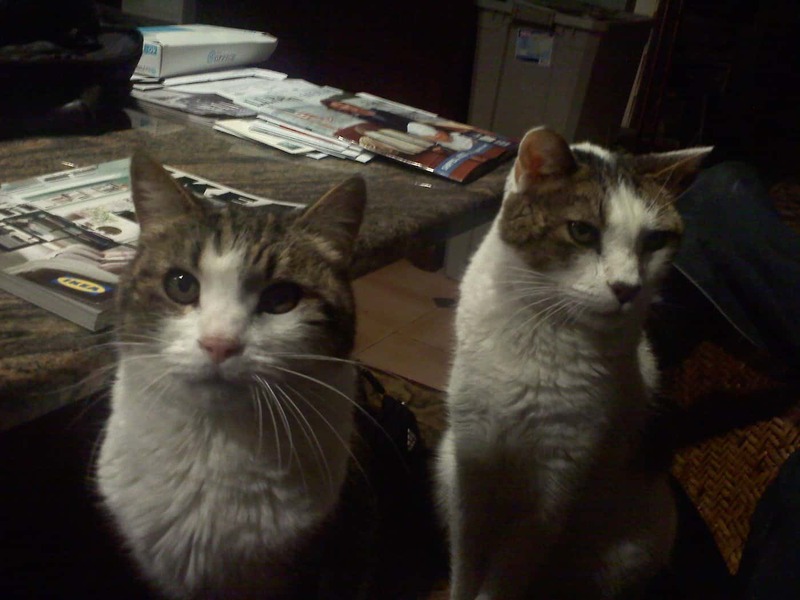 They both lived, long happy lives and just passed away earlier this year, from old age within a week of each other. They were 16. Those kitties made me want to take care of animals more than anything in the world. I started learning what it would take to become a veterinarian. Now, I have never been an extraordinary student. English and history were difficult until my senior year of high school, when I finally had a teacher invest some real effort in teaching me how to write properly and with purpose. Math and science, however, were always a breeze. I guess it came naturally for the daughter of two engineers (one civil, one chemical), which made a career in medicine a viable option. First hurdle vaulted over smoothly. Then came college. I chose to attend the University of Rhode Island with a major in Marine Biology. I went there for their marine biology program (much more exciting than regular Biology), their location (not too far from home), and the fact that I didn’t know anyone there. I was a third generation legacy too, with two grandparents, two aunts and one uncle also having attended. URI opened my eyes about a lot of things. I wasn’t interested in the party lifestyle and ended up moving off campus ASAP to my own house on the beach. All the beach houses are cheap in the winter, and I absolutely loved my converted mobile home with a view of Scarborough Beach in Narragansett, RI. I decided to try for a double major in Computer Science and minor in General Business. I started to slip away from becoming a veterinarian and wanted to become a full blown Marine Biologist. I overloaded my course schedule and started taking Honors classes to make more intelligent friends. During my sophomore year of college, I decided to become a volunteer for Mystic Aquarium. After all this time, I was back! I didn’t really want to work with the mammals, and ended up in the Fish & Invertebrate department, which manages the indoor exhibits. (If you’ve never been to Mystic, I highly recommend it, but most of the exhibits are outdoors: http://www.mysticaquarium.org/). The first thing I learned to do was clean the backup octopus tank. I had the annoying habit of showing up when the aquarists were at lunch, so they gave me this task to do to keep me occupied until they returned. I’d move the tiny gravel siphon across the entire 4’x4′ tank while Squirt, the resident octopus, would ride around on the siphon handle. Once I proved I could handle a simple task, I asked for more and more work. Feeding the stingrays and piranha, cleaning coral tanks, doing water changes, looking after quarantine fish, and helping with yearly shark physicals were among the amazing things I got to do. I took a summer internship with the same department and was allowed to run an entire gallery of tanks by myself. The people I worked with were the most amazing group of people ever. It was these colleagues that got my interest sparked in becoming a marine veterinarian. I would follow the instructions given by the veterinarian, but I wanted to know why a particular treatment was needed and what to look for. By this point, it my senior year of URI was just starting. I had moved to Charlestown, RI to be closer to the aquarium and have a little more space. I started to do some research into veterinary schools. The applications were due in one month. I decided to just go for it. What was the worst that could happen? So I got my application together, dropped the Computer Science major to another minor and got people to write my recommendation letters (three of which came from Mystic Aquarium staff). I got everything sent in just in time. I applied to six schools total. I continued to finish my degree and work at Mystic. Then the responses came back: no, no, no, no, no, maybe. The maybe was a waitlist at Tufts Veterinary School. Well, I went back to enjoying my senior year of college and just kinda forgot about that maybe. I started to make plans to become a veterinary technician at an all cat vet clinic near my parents. I had an offer waiting thanks to including a picture of my beloved Frisco with my application. Then I came home from school one morning and there was a message on my phone. I was accepted to Tufts. I drove home that very evening to tell my family. That next autumn, I started veterinary school. We learned about cats, dogs, horses, cows, sheep and goats. No fish. No marine mammals. Not even amphibians. Oh well. It was still fascinating to learn all about these animals. Not even a note outside of these six species until our Comparative Anatomy class. Finally some fish! Sadly, the class only lasted for a month and a half, but the fish lab was one of my favorite moments of vet school. I made it through the book learning and up to clinics. I took summer classes in aquatic animal medicine and got to meet other students and clinicians working in the aquatic medicine field. For clinical rotations, while most of my classmates were working in small animal private practices, I got to go to SeaWorld (Orlando, FL), back again to Mystic Aquarium, the Marine Mammal Center (Sausalito, CA), and work with a small animal (cat & dog)/aquatic veterinarian in Buffalo, NY. I was in heaven. I kept thinking, ‘Finally! This is the reason I went to vet school!’ But as you can probably guess, landing a job in aquatic medicine is not easy. So I started looking for another job in small animal or large animal medicine to get some experience until something opened up. But my heart wasn’t really in the job search. I wanted fish! I started asking for help from my mentor back in Buffalo, NY. She gave me an amazing collection of information to get me started. And what do you know, it turned into this. Aquatic Veterinary Services of Northern California was born! That’s the story up to now. I’m sure it will change a lot down the road. Thank you for your patience. If you are looking for a mentor to travel a similar road, I am happy to respond to any questions. It has been a long, and at times painful, journey, but absolutely, totally, unequivocally worth it. Please e-mail questions to ncfishvet@gmail.com. I have always loved this story – not many people can actually explain why they are where they are in life. Kudos to you!